Where to find the best mountain bike trails with waterfalls in New York State. Letchworth State Park is one of the jewels of the New York State Parks system with over 30 sparkling waterfalls set within the most beautiful gorge scenery in the northeast. 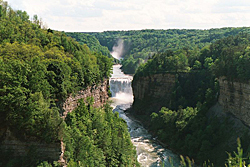 The Genesee River bisects the park and roars through a deep gorge between cliffs that tower over 600 feet high. There are good views of the major waterfalls from the Genesee Greenway and from several trails open to mountain biking within the park. Upper Genesee Falls: Height: 70 ft. This is the first of the three major waterfalls in Letchworth State Park. It falls as a solid sheet of water over a single drop. 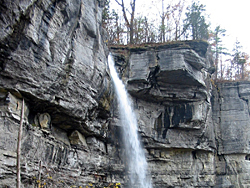 Middle Genesee Falls: Height: 107 ft. This is the second of the three major waterfalls. It falls as a solid sheet of water over a single drop. Lower Genesee Falls: Height: 70 ft. This is the lowest of the three major waterfalls. It is a tiered waterfall with 3 drops. Medina Falls: Medina Falls, a beautiful 40 ft. waterfall located on Oak Orchard Creek, is visible from the Erie Canal Trail just a few hundred feet upstream from the point where the creek flows under the canal. In 1913 engineers constructed a huge aqueduct to carry the canal over the creek. At the crest of the falls is what remains of a man-made wall, once part of a dam used by a mill at the site. The falls flow over ledges of "Medina Sanstone" a brownish stone with a slight purple hue that is used in region wide in buildings. Cohoes Falls: Height - 90 ft.
Cohoes Falls drops over 90 feet along the Mohawk River before arriving at the confluence with the Hudson River at the junction shared by the city of Cohoes and the town of Waterford, New York. 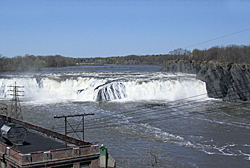 At 90 feet high and 1,000 feet wide, Cohoes Falls is second largest in New York State. Bicyclists can travel to Falls View Park via the paved Mohawk-Hudson Bikeway for unobstructed views of the magnificent Cohoes Falls. The 7 mile Keuka Lake Outlet Trail which is built on an old rail bed that followed the towpath of a canal that once connected Keuka and Seneca Lakes, dropping around 300 ft. along the way. Evidence of the Fingerlakes region’s industrial history can be seen all along the route including several old mill sites, railroad trestles, canal locks and two mesmerizing waterfalls: Seneca Mills and Cascade Mills. This impressive falls originally cascaded over limestone shelves. The top step of the falls is a dam that was built in 1827. This is the site of Seneca Mill, the first mill along the outlet and Lock 17. A Picnic area, parking and paddlers take-out are located here. A natural falls along the creek, Cascade is the site of a former mill complex. A novice level whitewater course for kayakers has been established below the Cascade. The Visitors Center is located nearby. Minelot Falls : Height - 115 ft.
A hike on the Indian Ladder Trail, a famous old Indian trade route, before or after your mountain bike ride on the John Boyd Thacher State Park mountain bike trails is a must. The trail descends 60 feet down a sheer limestone cliff face via a metal ladder and winds along the base of the Helderberg escarpment. The foot path passes under Minelot Falls. In the summer and fall, most of the water in Minelot Creek is lost to underground streams, but during the spring or after heavy rains the power of the falls is evident. Views of the valley below are just breathtaking. Over 50 miles of hiking trails and carriage roads lead cyclists and hikers along steep cliffs and rock ledges to high elevation lakes and gorgeous waterfalls. Awosting Falls: Height - 60 ft.
Awosting Falls is both the most easily accessible and spectacular of the park’s waterfalls. It is a short distance (1/4 mile) from the Park Entrance booth on the Awosting Falls Carriageway (red) leading to the Mohonk Preserve. The Peter’s Kill plunges 60 ft. over a sheer cliff into a wide pool. Rainbow Falls: Height - 60 ft.
A short foot trail from the Upper Awosting Carriageway (green) takes you to Rainbow Falls. The name comes from the prism of colors created by the sunlight as the waters of the Peters Kill drop from the overhanging rock ledge. You can actually stand behind the waterfall at its base. During spring there is a solid sheet of water, in summer more of a cool spray, but a welcome relief on a hot day! Stony Kill Falls is located on the northwestern edge of the Minnewaska Preserve on land recently acquired by the State of New York and The Open Space Institute .Current conditions only permit hiking as carriage road surface conditions do not meet adequate standards to offer mountain biking or equestrian use. Connects Smiley Carriage Road to the Stony Kill Falls area. From Route 209, take Route 44/55. Turn onto Minnewaska Trail. across from the Hudson Valley Resort sign. Make a left onto Rock Haven Road and continue until you see Shaft 2A Road on your left. Go to the end of Shaft 2A Road and park by the gate. The trail begins around the gate. The Vernooy Kill drains a moist eastern hemlock woodland and 500 acre wetland. Brown water, tinted by tannins from the surrounding forest, cascade in a series of falls and small pools. Take a break here and sit by the lower pool. The falls are upstream from the bridge that spans the creek. Below the bridge is a stone wall, a remnant of Cornelius Vernooy’s 18th century gristmill. 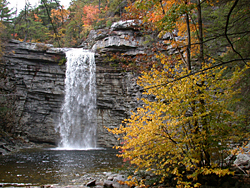 The falls are located in the Sundown Wild Forest-Catskill Forest Preserve. It’s a 1.8 mile mountain bike ride to Vernooy Kill falls on the multi-use trail from the trailhead on Upper Cherrytown Rd. The Wallkill Valley Rail Trail is one of the most scenic rail trails in the Hudson Valley. Trestle bridges, streamside waterfalls edged with mountain laurel, rock outcroppings dripping with ferns are just a few of the highlights along this trail. Diamond Notch Falls: Height - 15 ft.
From the parking area at the end of Spruceton Road it is around 1 mile to the falls along the Diamond Notch Trail (old roadbed). On West Kill Creek, the tiered falls drop 15 ft. into a charming amphitheater-like setting surrounded by high mountains. Just upstream a footbridge spans the creek.There is a small meadow nearby. The Speculator Tree Farm area offers a host of outdoor adventures including mountain biking, hiking, cross-country skiing, snowshoeing, snowmobiling and camping. 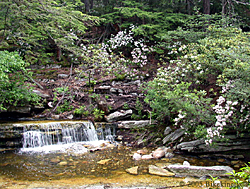 Take the time to visit one or all of the following three falls located nearby on the Sacandaga River, or East Branch of the Sacandaga River southeast of the town of Speculator. Austin Falls: Height - 40 ft.
Austin is a single 40 ft. chute that falls through a narrow section of the Sacandaga River. It is located along Rt. 8/30. Auger is a series of drops in a narrow gorge along the Sacandaga River. There are numerous potholes and a good swimming area upstream. It is accessed via a short trail from Rt. 8/30. Griffin is a series of three falls that cascade through a beautiful gorge on the East Branch of the Sacandaga River. It is accessed via a short trail from Rt. 8. Miles of cross-country ski and snowmobile trails, old dirt roads and singletrack bike trails provide a variety of mountain biking experiences for riders of all ages and skill levels in the area around Inlet, Old Forge and Raquette Lake. Death Brook Falls: Height - 50 ft.
A 50-foot high cascade located about 4 miles east of Raquette Lake Village on Rte. 28, west side of road. A short, flat trail provides an easy five minute walk to the falls. The trail circles to the right around a flooded area and passes an old junked car on the left before reaching the falls. Best viewed in the Spring or periods of heavy rain. At other time the flow can be reduced to just a mere trickle. There is a barrier 10 miles west of the village of Blue Mountain Lake, 3.6 miles east of the Sagamore Road, that marks the start of the short path. There is room for only a car or two.